Air conditioned rooms with shower, 2 twin or 1 double bed, hair dryer, telephone and safe (on rental),balcony / patio and garden view. 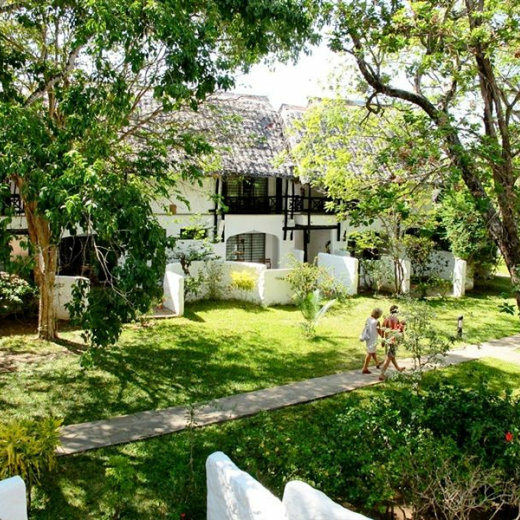 Located on the Southern Tip of Diani Beach which is a very private area. The superb landscaped gardens radiate a feeling of calm and serenity. There is a stunning pool, which radiates a tropical island feel. The sunken bar in the pool is ideal to sit and enjoy cocktails whilst lazing in the sun. Ideally located for combining a beach holiday with a safari holiday, or making the most of the wide range of day trips and activities that are on offer in-resort. Pappilon Lagoon Reef Hotel exposes you to a wide range of water sports including windsurfing, snorkeling and beach fishing, or book a diving trip with our resident dive team to explore the nearby coral reefs. The pool, with its own swim-up bar, is a great place to relax and there’s also a separate pool for children. 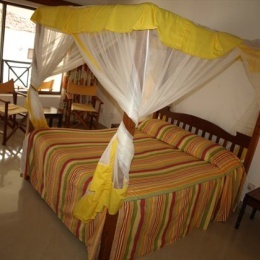 All rooms come standard with air conditioners, fans, safe, mosquito nets and balcony. A spacious buffet-style restaurant with an open-air terrace, serving international and Kenyan cuisine and international dishes. The spectacular Makuti-roofed baobab restaurant serves a plentiful buffet, after dinner, enjoy the varied programme of uniquely East African performance in the Zig Zag Bar.